Last night I dreamt I was being murdered by someone stabbing me through the heart with a pair of scissors. I was writhing on a yellow carpet with my chest cavity punctured and my lungs spilling out through my ribs, trying to wrestle off whoever the scissor-wrangling looney was, but I wasn’t strong enough. I could tell for ages I wasn’t going to be strong enough, so I just lay there limply and watched the scissors come plunging down again like a pneumatic drill about to decore a pavement. Crunch. Splat. Then I woke up with a newly-hatched phobia about my internal organs being turned into kebabs while I’m trying to sleep. And sewing kits. Unless that wasn’t a dream and I’m actually dead now. In which case, the afterlife is remarkably similar to regular life. And that, to be frank, is a terrific disappointment. Although it would mean I could conduct my own murder investigation. Everyone who’d like to murder me with scissors, one step forward. Now, given that I’m no longer here, you might think of me as being roughly analogous to the candidate who comes last in an election. The Land is Power fruitloop or Monster Raving Looney in the great campaign of life. I have been eliminated. But it would be a shame if the minority people that didn’t want to murder me with scissors – perhaps even felt strongly that I deserved not to be murdered with scissors – were unable to voice this opinion without being eliminated too. Especially, if they ended up being part of a broader majority of people who couldn’t agree on whether or not I should be murdered with scissors, but found common ground in their wider disapproval of the winning-with-a-minority candidate. In spite of construing a majority, those people would all become electoral zombies, voters disembodied from their candidate, squirrelled away into a pen marked “also-rans”, and subject to five years of beatings around the face by the zombie-bashing frying pans and cricket bats of their “elected” representative’s views, which they all voted against. Now the only thing we’ve established to any satisfactory degree of certainty is that I did deserve to be murdered with scissors. But the broader consensus of people who thought their individual candidates didn’t deserve to be murdered with scissors surely deserves a chance to be represented by the most suitable No To Scissor Murdering candidate. Especially if the largest minority of the votes (but a minority all the same) went to the Scissor Murderer himself. 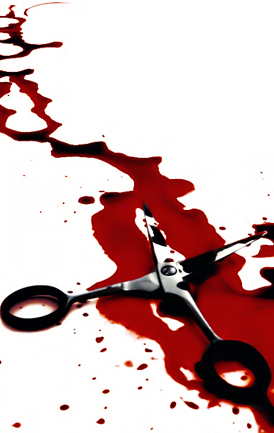 Stop the scissor murders. Give the zombies their lives back. Put down the coal shovel. Vote Yes to AV. ~ by David Thorley on May 5, 2011. I'm going to be waking up at 5am to put in a shift writing what may become a novel. This is where I clock on and off. Report me to the supervisor if I'm not at my post.